Screenjelly - Another screencasting app with a Twitter twist ~ Android Forever! 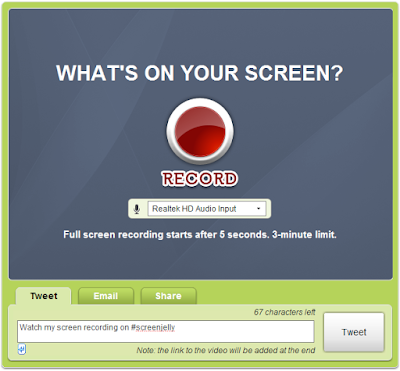 "Screenjelly records your screen activity with your voice so you can spread it as a video via Twitter or email. Use it to quickly share cool apps or software tips, report a bug, or just show stuff you like. To start recording, click on the red button. No need to install or download anything!"